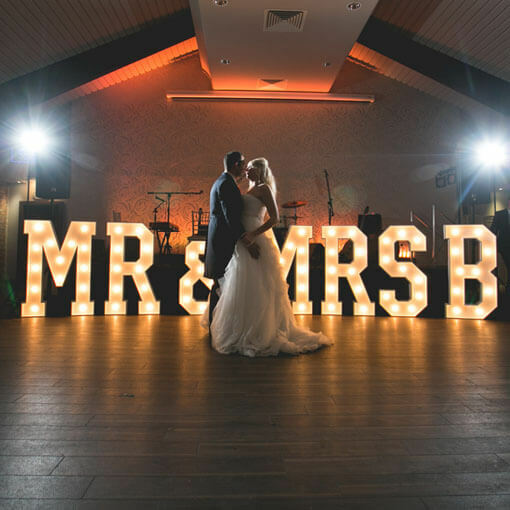 Light up letters, wedding props & back drops that you can hire! 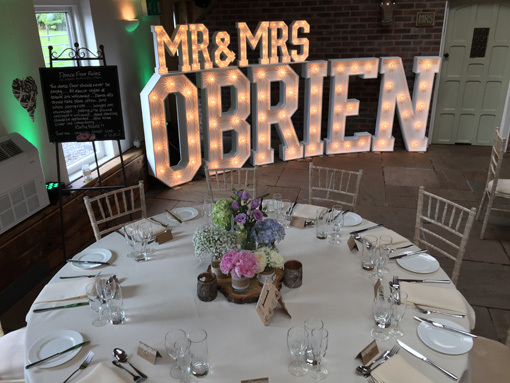 The first impression sets the feeling for any wedding or event and our light up letters, personalised initials, your new surname or company name in lights will certainly put a smile on everyone’s face! 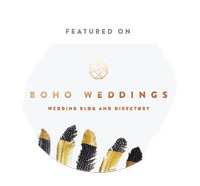 Our catalogue features our light up letters, props and wedding backdrops and frames The are all originals designed by us and are hand built in our very own workshop. 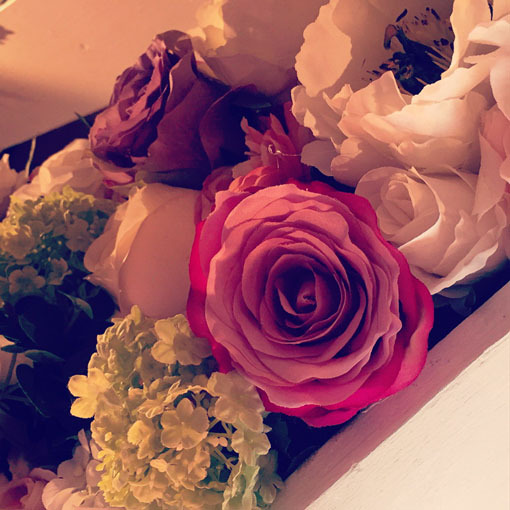 They create a stunning focal point, a backdrop, a pleasant distraction and talking point and you can add personalisation to any event whether it’s a wedding, birthday, photoshoot, bar/bat mitzvah or corporate function. 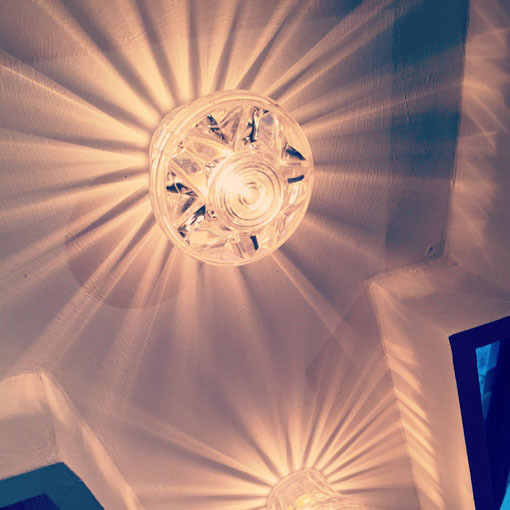 ‘Light is the magical ingredient that makes or breaks a room. It is the most important element in creating the right atmosphere’. 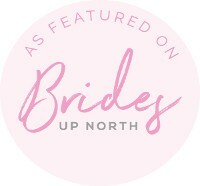 Here at The Word is Love we are proud to have been recognised as one of the award-winning wedding supplier in the country by winning The Wedding Industry Awards ‘North West Best Special Touch’. Though we don’t just supply weddings we are a hire company for all events including birthdays, corporate events – everything! We have all the letters of the alphabet in 4ft Classic and Rustic plus lots more fun props including question marks, exclamation marks and hashtags for the social media savvy. 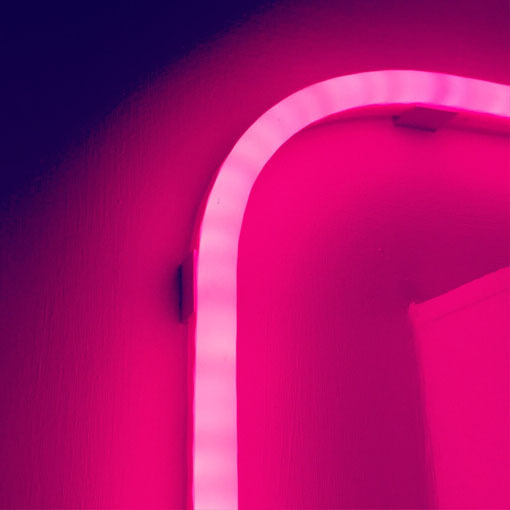 Our Wedding Neon Backdrops and Beautiful Frames create something different from the letters and are the new modern way to create a focal point. We love to create new props and that’s where our passion lies. Making, Creating and always bringing something new to this wonderful industry! Let your imagination run wild and contact us today. 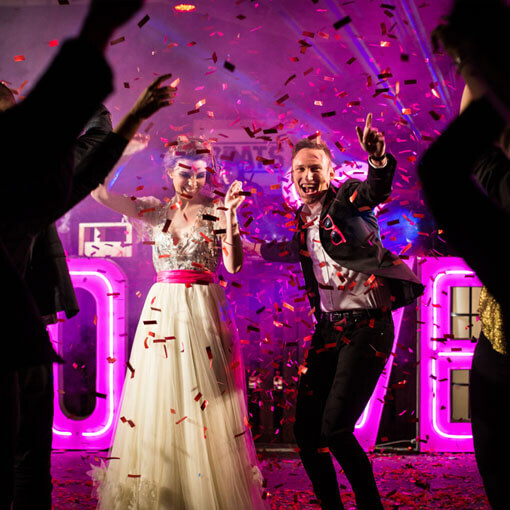 "Seeing our name up in lights is the perfect end to our perfect day"
When planning our own wedding back in 2012 we knew we wanted to include something totally different that would completely surprise our guests and leave them wowed & talking about it for weeks after. We wanted something big, bright & very theatrical. Something that our guests hadn’t seen before and something they were not expecting. And that’s how we made the first ever LOVE letters. The rest they say is history…. All our Letters are free standing 4 foot high by 2 foot wide (some are wider M,W,T,V etc) with a vintage custom designed font and matt white finish with beautiful Sparkle Led Bulbs. Low Watt and not hot, our sparkle cabochons are 3 watt and create a romantic glow. In our Sparkle range there’s even a choice of colours! In our Rustic Collection of Letters they come with filament Golf Ball bulbs and a dimmer for a soft romantic light for the evening dancing. ANY EVENT, BIG OR SMALL. We don’t just do weddings! 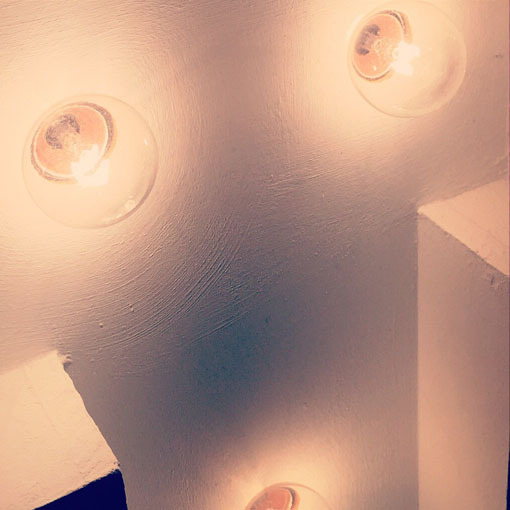 Our lights are available to hire for all events. If you are celebrating a birthday then let us light it up with our illuminated numbers! Or perhaps our Tabletop CAKE, SWEETS, and most importantly BAR letters! Or perhaps you’re planning a Photoshoot? We can bring down a selection of our props for the day. We’ve been involved in lots and are happy to stay for the day to help move things around and offer our experience and tips. Bar & Bat mitzvahs, corporate functions, shop window displays & charity events, we’re here to help bring your event to life with the original light up letters and props. If you have a big open space that needs filling or if you need to create an intimate and cozy atmosphere we have an array of unique and individual props that will do the job. If you need any help please just contact us for more information.